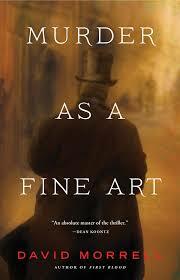 Murder as a Fine Art is a fantastic historical thriller! As I reviewed Inferno I criticized Dan Brown for the poor writing and character development. The same cannot be said of David Morrell’s writing. While Inferno was merely good entertainment, Murder as a Fine Art is brilliant and extremely well written. It artfully mixes fact and fiction and is truly genre bending: part crime fiction, historical fiction, thriller and police procedural. I love that Morrell uses Thomas De Quincy and his daughter as lead characters as the former’s renowned intellect and wit allow for fantastic dialogue. The writing is exceptional beyond the dialogue. I truly felt transposed to Victorian England and at times I would have sworn Dickens was writing the description of the English fog.